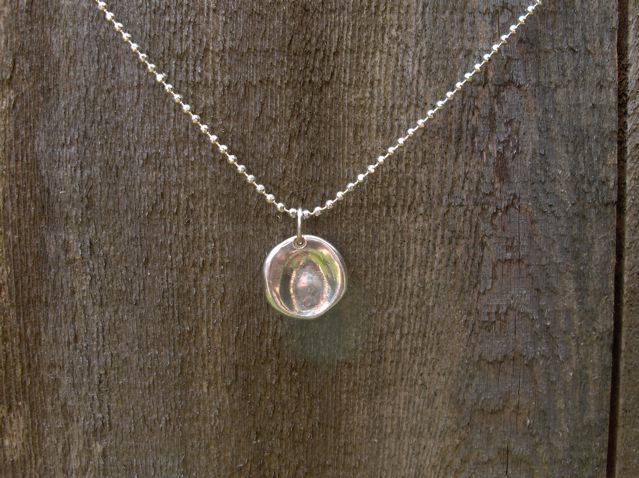 If you are searching for a last minute Mother’s Day gift, consider having me make a silver or gold charm of your child’s thumbprint! Gift certificates are available too. Come see my latest work this weekend at the Annual Creative Metal Arts Guild Show, April 24-26, at the Oregon Convention Center. Hours are 10-6 Friday and Saturday, and 10-5 Sunday. I have several new designs I’m unveiling. In addition, the Ceramics Guild, Handweavers Guild, Bead Society, and Glass Guild will be having their shows at the Convention Center this weekend…it’s a great time to view work from artists in the Portland area. I hope to see you there! I’ll be having a show of my work this weekend, April 4-5, at the Fine Arts and Crafts Fair, at the First Unitarian Church, 1011 SW 12th Ave, Portland, OR. The show runs from 10:30-6 on Saturday, and 10-2 on Sunday. It’s the first year the church is hosting this show, and I’m going to give it a try. Come by to see me! Finally had some new photos taken of my more recent work. They will be available for purchase soon in my Etsy shop, or you can contact me directly. This first one is the “Caged Tahitian Mabe Pearl” necklace, made of 18K yellow gold, Fine silver, sterling, Tahitian Mabe pearl, and Baroque Tahitian pearls. This one is the “Trapped Petrified Wood” pendant, made of Oxidized fine silver, sterling, and Petrified Wood. 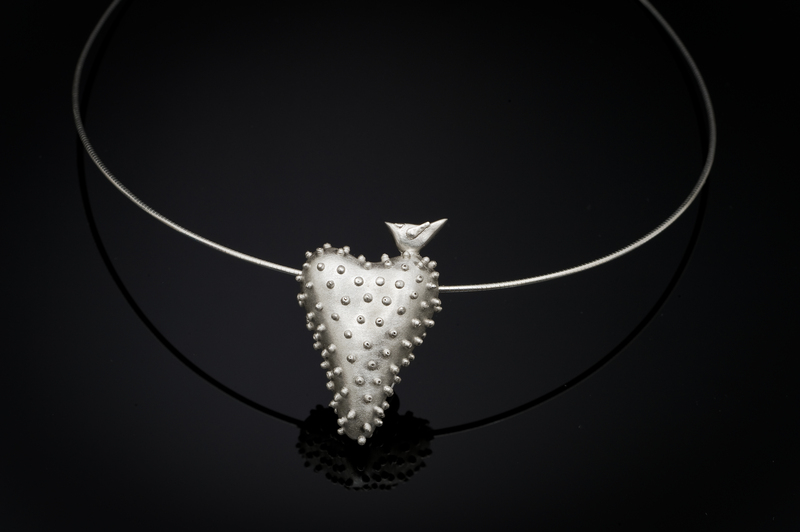 And here’s the “Hobnail Heart” in large, made in Fine silver and on a sterling chain. I get so happy when I have the opportunity to make an engagement or wedding ring! I am currently at work on three rings, so when they’re done I’ll post photos. But for now, here are some pictures of rings I’ve done in the past. These two photos are of rings I did in 18K white gold. The woman’s ring has a big chocolate diamond and smaller white diamonds set into it. These were fun to do. And this one was done for a dear friend of mine. She had no idea what I was designing for her, but her fiance was involved every step of the way. This was done in 18K white gold, and set with an amazing white diamond and two beautiful rubies. It looks phenomenal on her, and I was thrilled that she loved it! Here are some of my pieces. A few of these sold right away, but some are still available in my Etsy shop, or you can contact me directly. 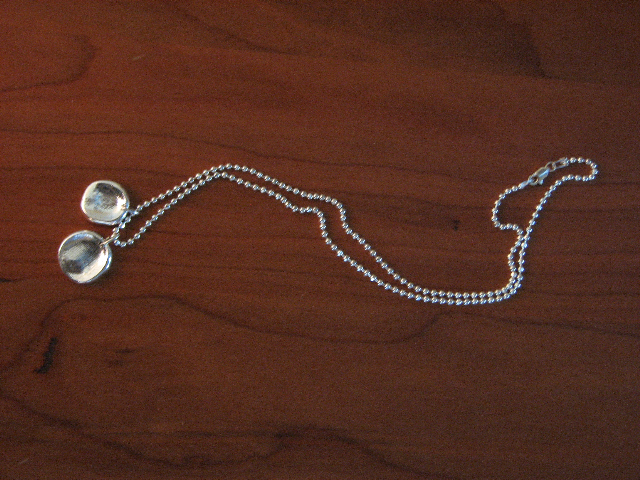 Here’s the “Trapped Moonstone” pendant. This one sold out quickly. And here’s Nicho Paloma. This particular one is sold, but I can make another to order. And the “Little Bird in a Window, with a Tree.” This was a special-edition, which is now sold out. However, I’ve released a similar one that is a bird in a window, also with a tree. It has a few changes from this piece. I will try to post a picture soon. Here are the Hobnail Cap earrings, set with Sleeping Beauty Turquoise. This type of turquoise comes from the Sleeping Beauty Mine in Arizona, and is naturally this intense shade of blue, with little to no veining. I love using it in my work. Here’s the Caged Larimar with Diamonds pendant, in fine silver and 14K. 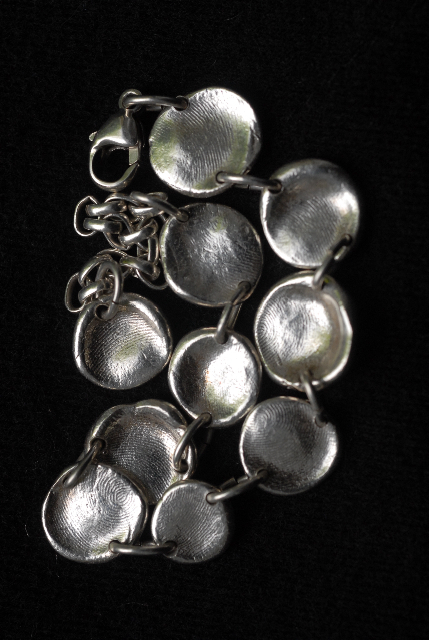 This one is sold, but I can do a similar one by special order, with the combination of stones and metal you want.